Chop and saw roots with a garden knife that is guaranteed to last a lifetime. It’s a new take on the traditional Japanese hori knife and is crafted from strong, but lightweight carbon steel. The blade is shaped like an inverted V and is lined with 12 rip-raw teeth on one side and a knife edge on the other. Together, they make quick work of the roots you might encounter while gardening. This tough tool is guaranteed to last a lifetime, too. Someday it may stop raining and I plan to tear through a ton of weeds the rain brought! I use this primarily for weeding and it works great. 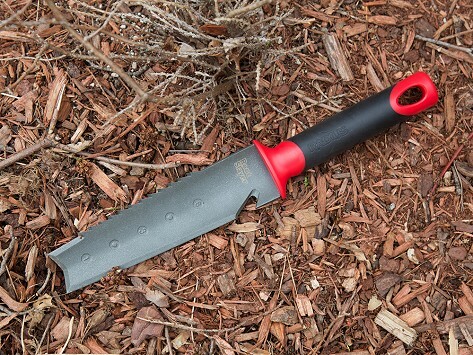 This knife is not just a knife but a multipurpose tool. Really cuts those taproots with no trouble. Quality tool. Very comfortable handle. Similar to some other tools costing several times more. Great price through Grommet.